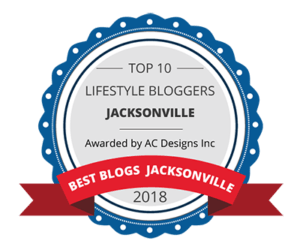 Over the last 3-4 years, there has been a major food truck CRAZE in Jacksonville! The industry is growing more and more each year which makes people like me very happy campers. There is just something special about food you can get out of a decorated little truck I can’t quite put my finger on. Perhaps it’s just having the option to try something unique, quick and yummy besides your normal fast food. Anywho, last month I attended a few food truck events with friends and boy was everything delicious! 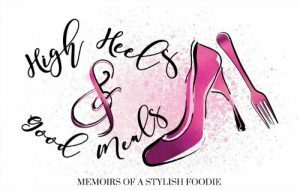 The March of Food Trucks was held in Tinseltown and parts of the proceeds went to March of Dimes. Eating good food with friends, listening to live music, all while contributing to the lifesaving research of babies was a great way for me to spend my Saturday! 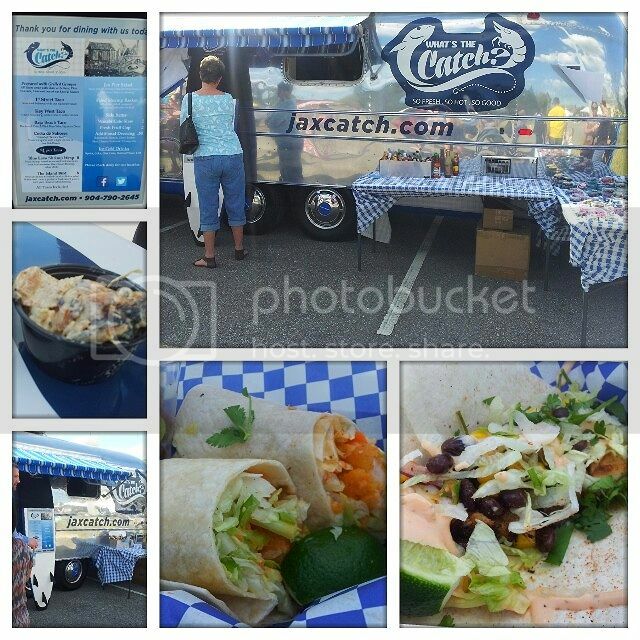 This is one of the “shiny” new trucks in town serving fish, shrimp, and chicken tacos! Baja Beach Taco: Delicious blackened grouper with black bean & corn salsa and special sauce! This was my fav! Blue Lava Shrimp Wrap: Fried Shrimp in volcano sauce and celery. It was good but I preferred the baja beach taco. While there, we had a brief conversation with Glen and he recommended the chicken salad wrap (The Island Bird). He gave a sample of the chicken salad and it was very tasty! Seasoned nicely and not too heavy. Something I’ll definitely try next time around. Overall, What’s The Catch was pretty good! Mama’s Argentinian Food was some of the best food I tasted at the rally. My friends got the beef empanadas that were so incredibly flavorful but the Seafood Bowl (seafood nachos w/shrimp and scallops)……..OH MY GOODNESS, so GOOD! Mama’s Food gets an A++ in my book! 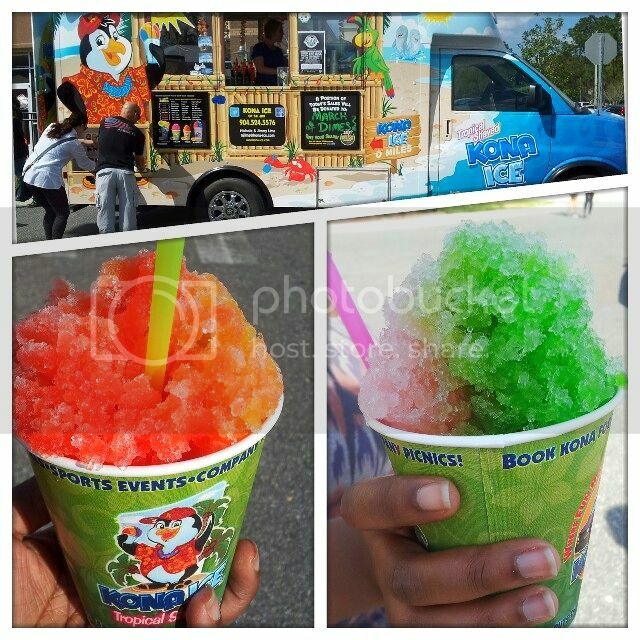 Kona Ice reminded me of summers at my grandmas in Louisiana during my childhood! Shaved ice cups were very big back then and it was nice to cool down with these! The owner of the truck recommended a drink that her and her husband came up with called the “Dude & Babe”. It was made with strawberry champagne and mango and it was deliciously refreshing. My friend had watermelon and strawberry which she said was very good as well. 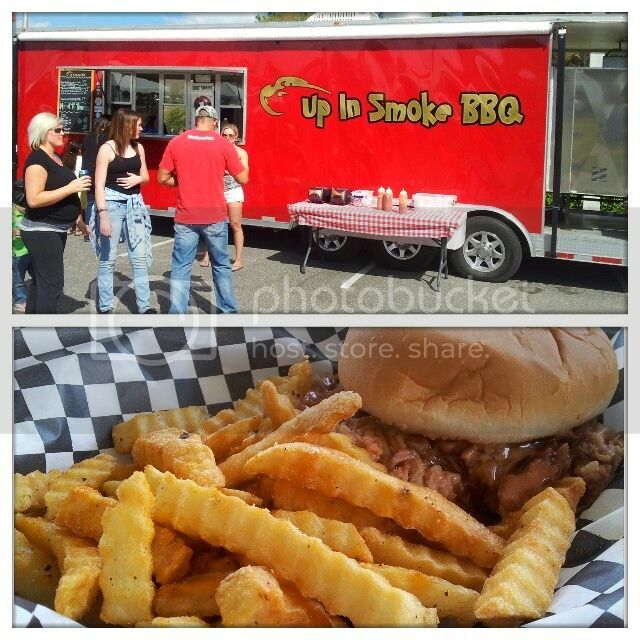 I have heard nothing but great things about Up In Smoke so one of my friends decided to get the pulled pork sandwich with seasoned fries. She said she was impressed with the amount of pork that was on the sandwich. She said it was very flavorful and definitely worth the money. I love the sweet and salty flavors I get from eating kettle corn so it was only right that I got some to go! 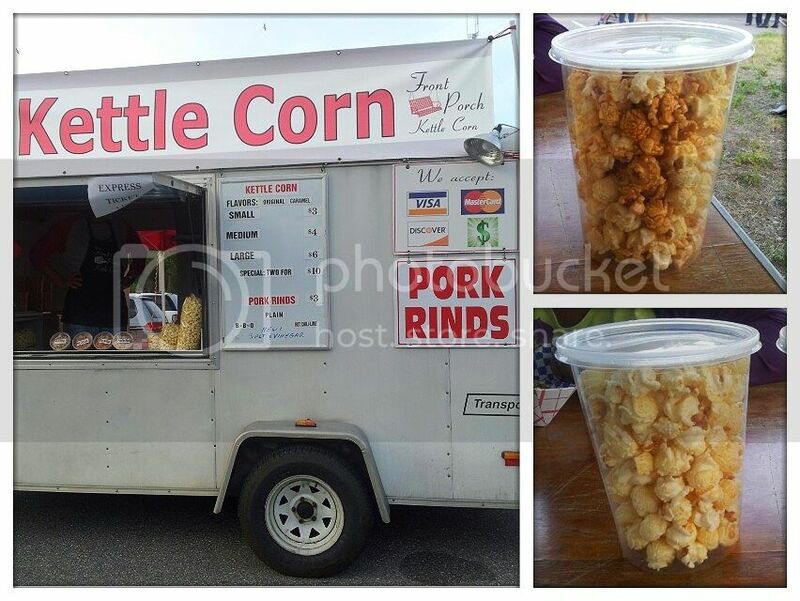 I got the original and the caramel kettle corn and my man ate all of the caramel corn before we made it out of the parking lot. They were both really good. 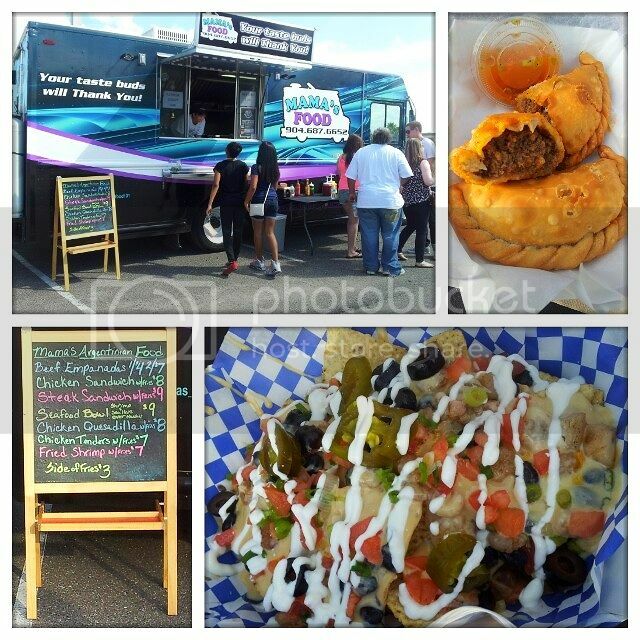 A few weeks after the March of the Food Trucks, was another Food Truck event at The Best Bet Race Track in Orange Park. There were two trucks in particular that I had been itching to try so I made the trip and it was well worth it. 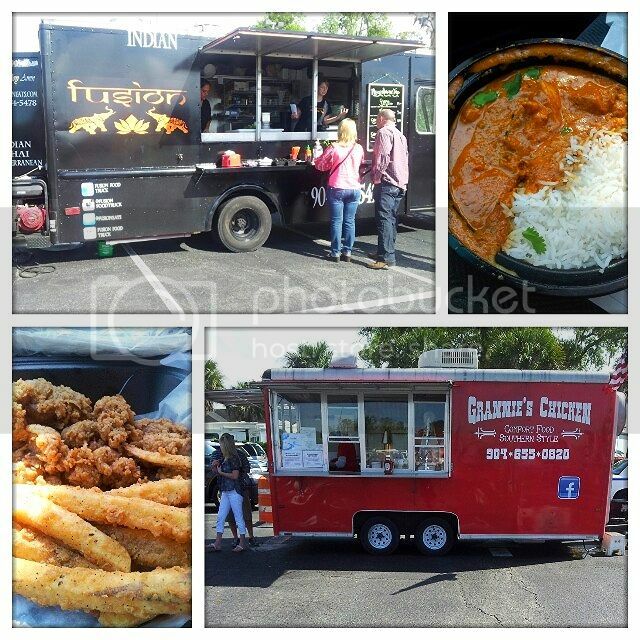 Fusion Food Truck is exactly what the name says, a fusion of flavors! Indian, Thai, and Mediterranean to be exact. I decided to try the Chicken Tikka Masala which was delicious. The flavors were so pronounced which is why I loved it so much! I could definitely taste the coconut and spices. Next time I visit Fusion, I definitely have to try the meat samosas! Grannies Chicken was on my list of trucks to try because come on…who doesn’t love fried chicken?!?!? I decided to go with the fried gizzards and seasoned fries. The batter was delicious but I guess I’m a glutton for punishment because I was chewing for days with those gizzards which was expected. LOL! I’m definitely going to go back for the chicken sandwich. Whew! That was a lot but it just goes to show that food trucks are on the rise here in JAX and I’m excited for what’s to come. The food looks amazing! I love food trucks as well but they only come around during Summer season.